Allyn Raifstanger’s unique Cajun-American restaurant, Allyn’s Café, is a dining staple in Cincinnati, Ohio. Raifstanger’s love of diverse cuisine and beers has earned the restaurant several awards in its 20 years of business including Best Beer List in the City, Best Café, Best Quesadillas, Best Patio, Best New Classic Restaurant, Best Place to Find a Local Musician, Best Wine Shop and many more. 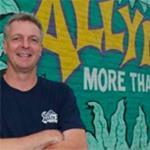 In 2012, Allyn’s Café was due for building additions and its third remodel and needed a business expansion loan. With a successful restaurant and no prior problems with his bank, Raifstanger wasn’t worried about gaining the financing he needed. To Raifstanger’s surprise, he was turned down by his bank and was forced to look into alternative financing. After a trusted source referred him to The Business Backer, Raifstanger set up a meeting to discuss his options. “I didn’t know who The Business Backer was but I trusted the person who told me about them, so I checked them out” said Raifstanger. The Business Backer reviewed Raifstanger’s financial history and renovation plan and were confident they could help him secure traditional bank financing. The Business Backer introduced Raifstanger to a partner bank whose lending approach fit Raifstanger’s business plan, and the bank provided him with a line of credit. Allyn’s Café has a completely new look, great new menu and continues to be a busy, popular restaurant. When it’s time for the next addition or update, Raifstanger knows The Business Backer will be there to help.